About this Yoga Stylus Pen And Phone Stand:Twist Action.Stylus On Top.Pen Cap Bends Over To Create Phone Stand.Special Instructions:Multicolor imprint is available, Please call for service.Rush Service:Catalog Quantities Only.One Color And One Location. About this All - In - One Ballpoint Pen, Stylus Led Light In Black, Blue, Or Red:The Mercury Stylus Metal Pen with Flashlight (Laser Engraved) Aluminum cap off ballpoint pen with LED light and capacitive stylus what works with touch screen devices. Finish / Material: Aluminum. 2 Accent Rings. LED Light. Black Ink. 3 Mercury-Free AG3 / LR41 Batteries Included.Special Instructions:Rush Service:1. Purchase Order must clearly state artwork instructions and logo to be used.2. One Color/One Location Imprint Only. About this Harmony Stylus Pen With Highlighter:Twist Action.Ballpoint Pen With Black Ink.Chisel Tip Highlighter.Stylus on Top.Special Instructions:Multicolor imprint is available, Please call for service.Rush Service:Catalog Quantities Only.One Color And One Location. About this Illuminate 4- In -1 Highlighter Stylus Pen With LED:Extra Bright White LED Light.Ballpoint Pen With Black Ink.Chisel Tip Yellow Highlighter.Stylus On Pen Cap.Unscrew Barrel And Push Down On Bulb To Turn On/Off Light.Battery Included.4-In-1 Pen With LED Light, Stylus and Highlighter.Special Instructions:Multicolor imprint is available, Please call for service.Rush Service:Catalog Quantities Only.One Color And One Location. About this Stylus Pen With Phone Stand And Screen Cleaner:Ballpoint Pen With Stylus.Screen Cleaner On Clip.Use Cap As A Phone Stand.Special Instructions:Rush Service:Catalog Quantities Only.One Color And One Location. About this Trilogy Highlighter Stylus Pen:Twist ActionBallpoint Pen With Black InkChisel Tip HighlighterTwist To Use Pen And Retract To Use StylusBlack ink, medium point.Special Instructions:Rush Service:Catalog Quantities Only.One Color And One Location. About this Satin Stylus Pen With Screen Cleaner:Twist Action.Stylus On Top.Rubber Grip For Writing Comfort And Control.Screen Cleaner On Clip.Black ink, medium point.Special Instructions:Multicolor imprint is available, Please call for service.Rush Service:Catalog Quantities Only.One Color And One Location. About this Frenzy 4- in -1 Ballpoint Pen:4-in-1 cap-off style aluminum ballpoint pen features chrome trims, Class II laser pointer, LED light, and capacitive stylus that works with touch screen devices. Three mercury-free AG3 / LR41 batteries included. Finish / Material: Aluminum. Black Ink.Special Instructions:Rush Service:1. Purchase Order must clearly state artwork instructions and logo to be used.2. One Color/One Location Imprint Only. About this Madison 4- in -1 Ballpoint Pen / LED / Phone Stand / Stylus:This multi-function twist-action ballpoint pen has a bright LED flashlight on the top, a capacitive stylus on the tip, and a hinged body that, when folded, works as a stand for your phone or tablet. It also offers a large imprint area on the clip. Black ink. Finish / Material: ABS Plastic. Utility Patent no. 9,796,208 B2.Special Instructions:Rush Service:1. Purchase Order must clearly state artwork instructions and logo to be used.2. One Color/One Location Imprint Only. About this 4- in -1 Light and Laser Ballpoint Stylus:Functions galore! The 4-in-1 has you covered with functions that include: ballpoint pen with black ink and rubber stylus tip, with flashlight and laser integrated into upper barrel. Soft rubber stylus tip is integrated into a removable barrel. Stylus ideal for everyday use including public touchscreen pads such as retail payment pads and ATMs. Laser pointer has 100' range. Includes batteries. Manufactured By Leeds. Materials: BrassSpecial Instructions:Other imprint methods/areas may be available; please call for details. Please note that product images may not depict the standard imprint method included in pricing. About this Jupiter Ballpoint Pen / Stylus / LED Light:Aluminum cap off ballpoint pen has a capacitive stylus that works with touch screen devices, chrome accent rings and clip, and an LED light that illuminates the ballpoint writing surface when turned on. Three mercury-free AG3 / LR41 batteries included. Finish / Material: Aluminum. Black Ink.Special Instructions:Rush Service:1. Purchase Order must clearly state artwork instructions and logo to be used.2. One Color/One Location Imprint Only. About this Silver Element Stylus with Screen Cleaner:Built in soft touch stylus; clip featuring built in screen cleaning pad.Mechanism: Plunger-Action, Stylus.Ink Color/Point Style: Black ink with medium point.Built in soft touch stylus.Clip featuring built in screen cleaning pad.Special Instructions:Rush Service:The standard imprint method, 1-color/ 1-location is available. About this 6- In -1 Quest Multi Tool Pen:Twist Off Middle Portion For Screwdriver1 Flat Head And 1 Phillips Head BitSlide Switch To Turn Light On/OffExtra Bright White LED LightBattery IncludedTwist Off Pen CapBallpoint PenRubber Grip For Writing Comfort And ControlStylus On Pen CapHolds A Variety Of Phone Sizes For Easy ViewingBlack ink, medium point.Special Instructions:Rush Service:Catalog Quantities Only.One Color And One Location. About this Cross(R) Tech 3+ Satin Black Multi Function Stylus:Whether you focus on the big picture, the details, or both — do it all with Tech3+. With a simple twist of the barrel, switch from black ink, to red ink, to mechanical pencil. An included stylus tip allows you to use your smartphone and tablet plus a twist off top reveals an eraser. Truly the modern day multi-function solution. Includes Cross® premium gift box and lifetime mechanical guarantee. Material: Brass. Manufactured By Leeds.Special Instructions:Other imprint methods/areas may be available; please call for details. Please note that product images may not depict the standard imprint method included in pricing. About this Nash Pen - Stylus - Highlighter - Glamour:Dual-function.Twist-action ballpoint pen and yellow highlighter.Includes soft rubber stylus tip for touchscreen devices.Material: Plastic.Special Instructions:1 Day Rush, available upon request for 1 color, 1 imprint location orders. About this Nash Pen - Stylus Light:Twist-action ballpoint pen with soft rubber stylus for touchscreen devices.Single white LED located at the end of the barrel.Use slide button to turn light on and off.Material: Plastic.Special Instructions:1 Day Rush, available upon request for 1 color, 1 imprint location orders. About this Volt Ballpoint Pen / Stylus / LED Light:3-in-1 cap off ballpoint pen has a colored cap, chrome barrel and trims, LED light and a capacitive stylus that works with touch screen devices. Three mercury-free AG3 / LR41 batteries included. Finish / Material: ABS Plastic.Black Ink.Special Instructions:Rush Service:1. Purchase Order must clearly state artwork instructions and logo to be used.2. One Color/One Location Imprint Only. About this Flashlight With Light - Up Pen:Slide Switch To Choose Light Setting.Extra Bright White LED Light.Use As Flashlight Or Light-Up Pen.Break-Away Neck Cord.Button Cell Batteries Included.Special Instructions:Rush Service:Catalog Quantities Only.One Color And One Location. About this Sovereign Laser Pen - Stylus:Ballpoint pen/laser pointer with removable cap.Cap includes soft rubber stylus for touchscreen devices.Button-activated white LED light and red laser pointer.Swiss nib.Material: Lacquer-coated nickel-plated brass.Special Instructions:1 Day Rush, available upon request for 1 color, 1 imprint location orders. About this Aperture Ballpoint Pen / Stylus / LED Light:The Aperture aluminum cap off ballpoint pen has an LED light and a capacitive stylus that works with touch screen devices. The LED shines through the stylus. Utility Patent Pending. Three mercury-free LR41 batteries included. Finish / Material: Aluminum, ABS Plastic, Brass.Black Ink.Special Instructions:Rush Service:1. Purchase Order must clearly state artwork instructions and logo to be used.2. One Color/One Location Imprint Only. About this Nash Pen - Stylus Light - Gloss Finish:Twist-action ballpoint pen with soft rubber stylus for touchscreen devices.Single white LED located at the end of the barrel.Use slide button to turn light on/off.Media device not included.Material: ABS Plastic. About this Nash Pen - Stylus - Highlighter - Crystal:Dual-function.Twist-action ballpoint pen and yellow highlighter.Includes soft rubber stylus tip for touchscreen devices.Media device not included.Material: Plastic. About this Sleek 3 in 1 Pen / Stylus:Sleek metallic barrel.Narrow stylus tip for more control.Twist action pen.Pen pivots to act as phone stand.Special Instructions:1 Day Rush: 1 color, 1 location. PMS color matches are not available with 1 Day Rush. About this Bettoni 5- in -1 Pen:Twist-action ballpoint with textured metal grip, spirit level, 3" ruler, small Phillips and flathead screwdriver and a capacitive stylus that works with touch screen devices. Finish / Material: Brass.Special Instructions:Rush Service:1. Purchase Order must clearly state artwork instructions and logo to be used.2. One Color/One Location Imprint Only. About this Trey Highlighter Stylus Pen:Plunger ActionBallpoint Pen With Black InkChisel Tip HighlighterPush Down To Use Pen And Retract To Use StylusRubber Grip For Writing Comfort And ControlBlack ink, medium point.Special Instructions:Rush Service:Catalog Quantities Only.One Color And One Location. 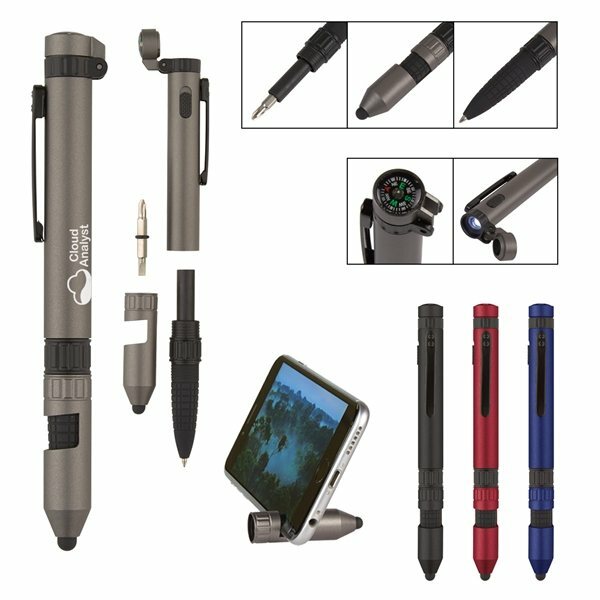 About this Atlas Laser / Stylus / Flashlight Pen:Four-in-one writing instrument with capacitive touch stylus, black ink ballpoint, LED flashlight, and laser pointer. Removable metal stylus cap hides ballpoint underneath. Shiny color metallic barrel, includes clip, and silver accents. About this Curvaceous Stylus Ballpoint with light:Everyone's favorite curvaceous ballpoint stylus pen; now with a bright led flashlight tip!Rich jewel tone color barrel; shiny silver accents; rubber grip and soft cushion capacitive tip stylus designed to mimic your finger and keep your touchscreen fingerprint free!Comes with black ink, requires (3) ag3 batteries (included). Want to give out a writing utensil that’s more than just a pen? These custom branded multi-function pens also have flash lights, styluses, and more! When you give someone a multi-function pen, you’re giving someone the convenience of always having a flashlight, highlighter, or stylus on them as well. That means they’ll likely carry your branded product everywhere they go. Giving away a cool pen with an extra function can also increase your authority. Giving away flashlight pens when giving talks about safety or stylus pens when giving talks about technology enhances the perception that you know what you’re talking about. When someone comes equipped with tools of the trade, others will listen. Whether you’re looking for neat trade show giveaway or a pen for the meeting room, AnyPromo has a pen with extra features to fit your needs. If you’re looking for a budget-friendly tech giveaway, stylus pens that work with smartphones are a fan-favorite. Nothing commands more attention during a meeting than executive laser pointer pens with laser engraving. Why do so many businesses trust AnyPromo for personalized multi-function pens? AnyPromo is the best source for wholesale custom dual-function, highlighter, and multi-color pens because not only do we stand by our product with a 100-day return policy, we guarantee the lowest online price. With promotional multi-function pens, you have tons of customization options. Whether you’re looking for full color printed stylus pens or engraved laser pointer pens, you’re sure to find the multi-purpose pen to represent your brand. Screen printing, which involves applying one or more layers of ink to your custom pen through a custom-made mesh screen of your logo or design. Full color printing, which involves a digitally printing a full color image on your pen with CMYK (cyan, magenta, yellow, black) ink. Most customers choose screen printing because it leaves a consistent print on flat surfaces like pen barrels. Screen printed multi-function pens are a customer-favorite of all industries because they are simply cooler than normal pens. That’s why no top-tier promotion is complete without being equipped with neat giveaways like a multi-function pen. When giving out custom printed pens, we know how important it is for the imprint to be clear and distinct. We have a 100-day return policy so that you can shop with assurance you’ll really get a quality logo on your product. We also have a graphic design team at your disposal free of charge so that you don’t have to be an expert to get a custom screen printed combo pen that looks good. 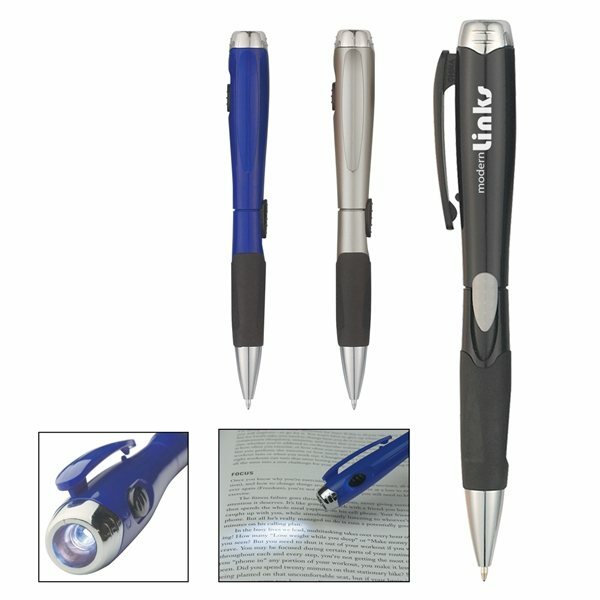 AnyPromo is the cheapest online source for custom branded flashlight, highlighter, and stylus pens. If you find any of these multi-purpose pens customized cheaper anywhere else, we won’t just match the price, we’ll beat it. Everyone appreciates having LED flashlight pens handy when looking for something in the dark. Stylus pens are a customer favorite because they are a great accessory for smartphones. When buying multi-purpose pens wholesale for giveaways, we know how much our customers care about getting a competitive deal. That’s why if you find the same multi-function or dual-purpose pens at a lower price elsewhere, we’ll beat the price by 10% of the difference. That’s our best price guarantee. We are dedicated to making promotional multi-pens affordable. With AnyPromo’s selection of budget-friendly combo function pens for customization and our lowest price promise, even small businesses can afford to promote their brand with combo function pens imprinted with their logo or custom design. “Making marketing make cents” means squeezing out every possible penny of savings and passing this value to the customer. That’s why we believe it’s so important to stand by our promise to save you the most money on logo printed combo pens. When finding your preferred source of custom multi-function pens, we know that customer service matters. At AnyPromo, we believe buying promotional multi-purpose pens with your custom logo should be as easy as possible. Buying promo pens with styluses, phone holders, or highlighters for your company or organization should never be a hassle. Our customer support team is ready to help you find the right multi-feature pen to go with your branding. You don’t need to navigate our giant selection of bulk and wholesale multi-function pens alone. 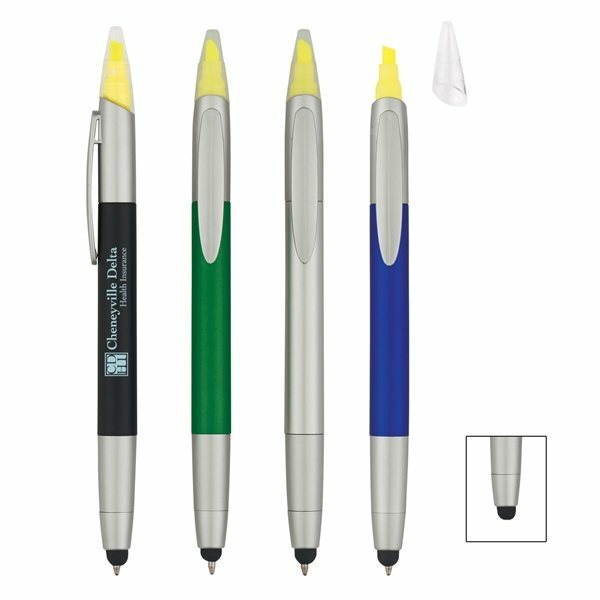 Do you need a stylus pen that matches your company or school colors? 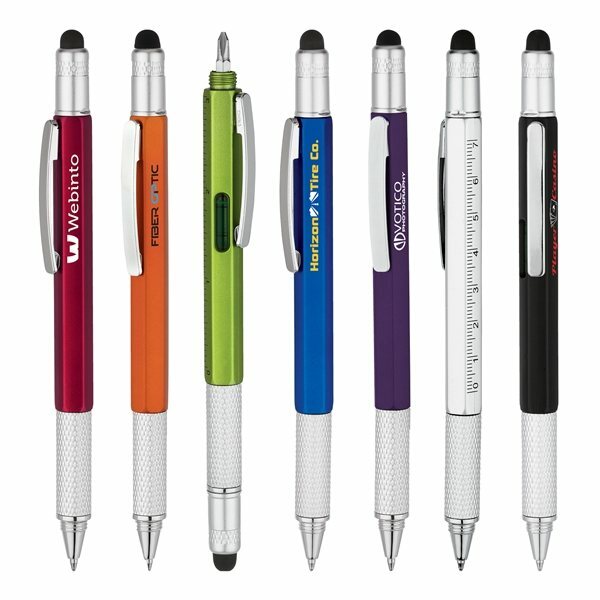 Give our promotional product consultants a call to find the perfect colored pen with a stylus tip or cap. Are you looking for a pen with a screwdriver? Let us know, and we’ll get a product specialist to assist you find the right multi-tool pen. Trying to get promotional laser pointer pens on a budget? Let our customer service agents know how much you’re working with, and we’ll find pens with laser pointers at the right price. Still have questions about getting custom multi-pens made with your logo or custom design? Call us at 1 (877) 368-5678 or hit “Live Chat” at the top of the page to get in touch with our friendly experts who can help you find the right multi-function pen to spread your message. With 130+ promotional multifunction pens available in our selection, the perfect one is bound to be available for you. We have stylus pens, highlighter pens, pen with phone stands, pens with LED lights, screwdriver pens, and more! Multifunction pens with different features are fun to have! Most customers like to have pens that have more to them than just being able to write. We have many pens in our selection that includes more features to them. Promotional multifunction pens are great for anyone who loves pens! Pens are used daily, give your students or employees the writing tool they need! Look through our selection of multifunction pens. Shop here! Just like our customers, AnyPromo sets the bar high when it comes to making a big brand impact while getting the best bang for your buck! Click through our inventory of promotional multifunction pens to find what best fits your goals. Save money and make a BIG hit with these specially priced pen combos. Great for traditional writing, tablet and mobile interactions, our pens bring mundane administration and correspondence to life! Check out hot sale pens now at AnyPromo. Promotional multifunction pens are fun for everyone to have. If you’re looking for more than just a pen, this selection is just for you! Give promotional multifunction pens to your employees or students. These pens are great for home, work, and school! Our featured list of multifunction pens include our top sellers in this category. Don’t miss out on this useful marketing tool that everyone can use!